I no longer have access to some of my previous blog content, which is sad to me. So I thought I'd reintroduce the new and improved ArduFrauenfelder! He has gained a CNC at the end and is going through his beta development. He is up to version 0.1-b3 and is continually changing as I learn more about how to use ECAD tools and electronic design. A big change since last we met is that I am using EAGLE as my primary design software (I am still using KiCad but as a secondary tool set, meant to compliment EAGLE). I decided to give the freeware behemoth another chance as most people, both hobbyist and commercial concerns, seem to be using it for electronic design. 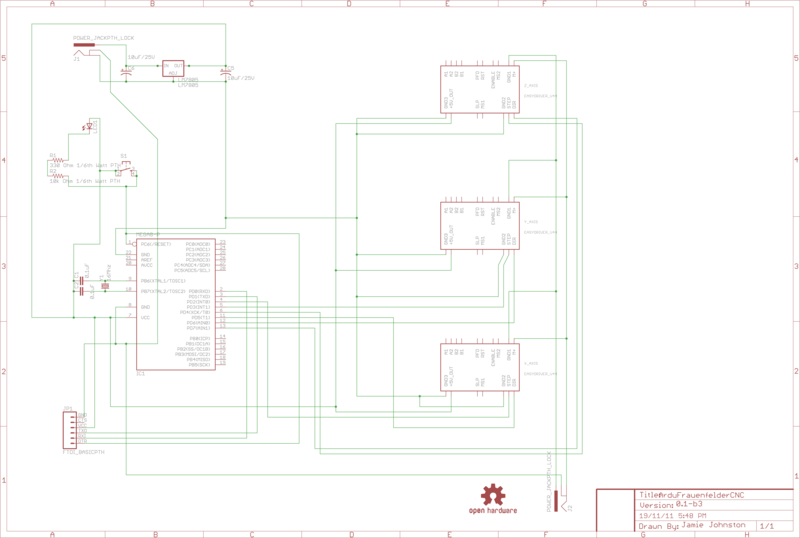 With KiCad I was disappointed with the lack of native libraries out there (like SparkFun and Adafruit EAGLE libraries. They didn't create KiCad versions, community members have attempted to though), not to mention eagleUp. But with EAGLE I can design with it and then convert to KiCad, whereas you can't do that in reverse. 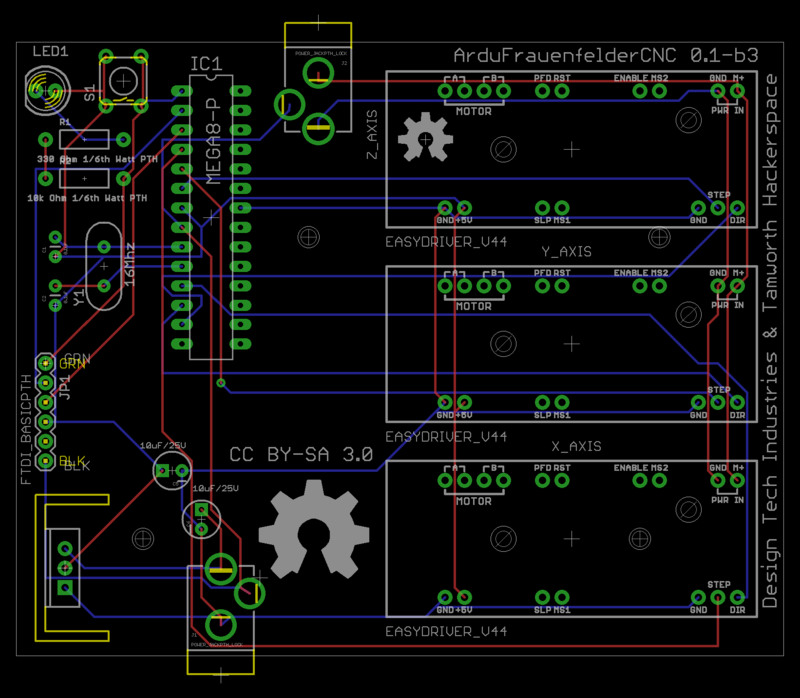 I will release the ArduFrauenfelderCNC board design files in both flavours, but EAGLE will be first. You may remember I released the ArduFrauenfelder on GitHub but it wasn't anywhere ready for release into the wild. I mainly did that to try and find help, which I didn't. After not getting anywhere I decided to rethink the design and came up with my new naming scheme. ArduFrauenfelder will be the base name for any Arduino device I design, adding designators to the end to complete the name, i.e: CNC denoting the board is CNC related. I also decided to use EAGLE and to become somewhat more serious in my endeavour. I have also decided to make it a joint venture between myself, Design Tech Industries, and the yet non-existent Tamworth Hackerspace which I hope once established can sell the boards as kits and finished products (fully constructed board and mill) to raise money for our shenanigans. Box one shows the three labels: feature request - Green, improvement - Orange, bug - Red. Box two shows the naming scheme, which is to add in brackets what the issue is, i.e: [improvement] for improvement etc... As you can see I've already added a couple improvement and feature request suggestions. I'm currently pro typing the board on perf board, which is a little messy, but I feel like it's what I should do. Next I'm going to attempt to create the design files for the actual mill and see if I can get it cut out. I hope you choose to have a fiddle with my creation and to help me along it completion. It is released under an Open Source Hardware friendly license, meaning it allows commercial use of my design. This is here mainly for my own edification as I'm new to the whole NDS flash cart scene. This little tutorial is basically what you'll find in the embedded video below (credit goes to sneakwit), I've just used my own FTP server instead of Smallftpd, plus uploaded NDS_backup_Tool.zip as sneakwit's link no longer works. +Plus - NDS_Backup_Tool.zip and Smallftpd, if you're not using an online FTP server. Links at bottom of page. So first you need to unpack the contents of NDS_Backup_Tool.zip and alter the NDS_Backup_Tool_Wifi.ini in notpad or Notepad++. You need to change the serve IP address and the username & password to match that of the FTP server you are using. Save altered .ini file. Copy NDS_Backup_Tool_Wifi.nds, NDS_Backup_Tool_Wifi.ini and ôÃé±é+âl.txt to the root of your SD card (the root being the top of the folder and not inside any other folder. If placed in any other folder it defaults to anonymous and an IP of 192.168.0.10). Load SD card into your CycloDS Evolution or equivalent. Start the flash cart and navigate to NDS_Backup_Tool_Wifi.nds and run it. It will start and immediately start connecting to your AP (that we preconfigured with a WiFi enabled game) then it will connect to the FTP server we included in the .ini file. Once connected it will ask you to remove your CycloDS Evolution and insert the game you want to backup (well, it uses rather bad English but you get the gist). Once the game is inserted it will give you a menu. Scroll through it with the L and R until you get to the NDS backup menu and press B to start. Smallftpd - is a simple, small and free FTP server for Windows.